So shoot me? I join one other reviewer is describing these performances as "uninspiring." I remember when I was a kid, listening to chamber music—or rather "overhearing" my dad listening to it—and thinking what a chore it must be to have this be your only music, when The Beatles and the Rolling Stones and Hendrix were doing so much creatively. There was a see-sawing, "nowhere" sound to what he preferred—just a bunch of nebulous background music. Now I hear it all so differently. But this particular set takes me back to the time when I simply could not understand what the fuss was all about. These performances are without question technically flawless—insofar as I’m qualified to judge, that is. Tone is gorgeous, and here and there, a transient magic appears. I've ordered the Leopold Trio's set, and can certainly compare it as I descend further into way too much Beethoven chamber music. Is it possible these trios are themselves not so hot, just no big deal as compositions? Now that I think of it, I also have the wonderful Vivarte box collection (good deal, 60 count 'em 60 CDs, with lots of Anner Bylsma on violincello, the man who literally wrote the book on breathing for cellists), and that includes these pieces as performed by The L'Archibudelli String Trio. Let me check them out. This set sounds—again, so shoot me—strangely vague and unfocused. 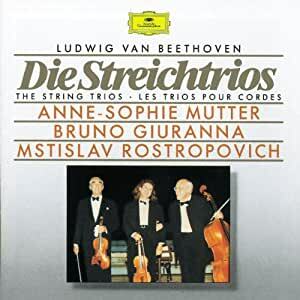 These are respectable performances of Beethoven's string trios - very mild compositions, but well worth listening to. 5つ星のうち3.0Not a thrilling listening experience for me. that , to me, the trios themselves are not to my taste. I was disappointed. While the playing is exemplary - it seems Giuranna is lost in the mix, Mutter seems to dominate the recording. I can't quite put my finger on it, and even tho' I like the recording, the tonal balance seems a bit strident at times. Perhaps it would be more suited to a valve, and not a solid state, amplifier. Puzzled. I ran the CDs through audacity, and there is a definite bump-up in db between 2khz and 4khz; this may explain the stridency I hear in the violin. It isn't my stereo system, it probably isn't Mutter; it likely is the sound engineer, influenced by his/her taste for those upper trebles.